Cherry Creek Arts Festival is consistently rated as one of the top arts festivals in the country. Nestled in Cherry Creek North, an arts-focused neighborhood in Denver, Colorado, the festival regularly attracts a serious-buying art community and draws an estimated 330,000 attendees each year. Naturally, such a show is popular among artists, and with more than 2,100 applicants every year, Cherry Creek Arts Festival has one of the most competitive jury processes in the country. This year, the ZAPP team visited the festival’s jury and spoke to the CherryArts team about their jury process. 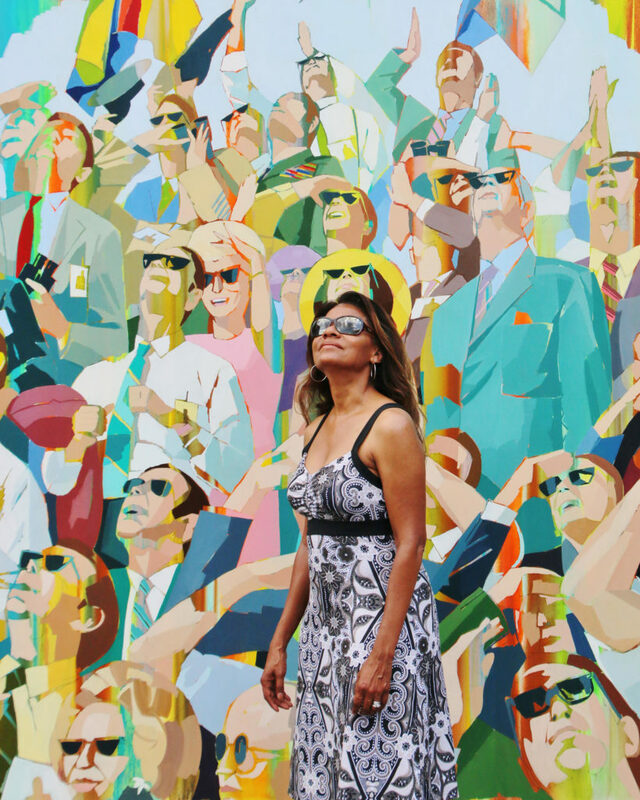 Cherry Creek Arts Festival conducts an in-person, projected jury. 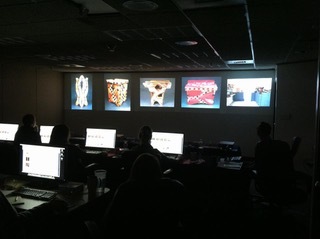 In this projected jury, all five images (four images of artwork and one booth or display image) are projected simultaneously in a horizontal grouping. JuryBuddy™, an application created by ZAPP, allows for the distribution and synchronized projection of high definition artist images. The process begins when all applications have been received and reviewed by the CherryArts team. The team at ZAPP then begins preparing the submitted images for projection. Before the application even goes live, five jurors from around the nation are invited to make up the panel that will score, and ultimately select, exhibitors for the festival. The jury panel includes two artists from the previous year’s award winners. These jurors bring the benefit of an artist’s perspective to the jury and, as they are exempt from the process, there is not a conflict of interest. The remaining three jurors on the panel are art professionals chosen to represent a diverse range of expertise across multiple disciplines. Returning jurors are rare and happen only on anniversary years. The most recent instance of returning jurors was for the 20th year anniversary of Cherry Creek Arts Festival in 2015. Once the jurors are selected, the CherryArts team organizes juror flights, lodging, stipends, and any other necessary logistics. It isn’t a simple process to organize a jury panel while also managing applications and event promotions, but the CherryArts team feels it is well worth the effort to have all their jurors convened in one location. Once all of the pieces are assembled and the applications are in, it’s time to get started on the jury process. Every year, before the jurors begin scoring, CherryArts’ executive director, Tara Brickell, gives the jury specific selection criteria. Jurors are tasked with a critical role: to select a show based on artistic excellence, taking into consideration the quality, creativity, and overall impression of original, hand-crafted work created by the artist. Jurors are also asked to select a show that is representative of diverse styles and techniques, with a broad range of pricing. All decisions made by the jury are final, and jurors are directed to focus on an assessment using critical observation rather than personal taste. The jury process moves through several rounds of scoring over three and a half days, taking more than 28 hours. The first round is completely silent. Artist images are viewed by media and sorted by the date the application was submitted. Artists who have applied to the emerging artist program will have their images reviewed and scored, but all will be scored together and not by media within this category. The jury first views a preview of all applications within a media category to get a “feel” for the artwork being presented. After the preview, jurors begin scoring on laptops using a range from 1 to 7. Jurors from the past Artist Image Review Workshop review submitted images. The CherryArts team keeps the jury open during the first round because artists can learn a great deal from viewing other images, and their own, in this setting. For example, artists can see how cohesive a body of work is, how the size and scale of the images present when viewed simultaneously, and how the background color impacts a juror’s view. This also helps artists to better understand the importance of using professionally photographed images and an up-to-date booth shot in their applications. How was the artwork created? Does the artist demonstrate that they know how to display their work professionally? Is the booth shot recent, and does it reflect the work submitted with the application? Does the artist have a coherent body of work? Will this work do well at the Cherry Creek Arts Festival? What are the price points of the work? Conversations about booth shots occur frequently during the Cherry Creek Arts Festival jury. Jurors discuss booth shots that appear dated as well as those that contain bodies of work that are not represented in the four other images the artist submits. The show does not have quotas per category, nor is there a requirement regarding the ratio of applications received to the number of artists selected. The jurors will ideally select a show that is representative of a variety of artwork overall and within each medium category. Once the artists have been selected, three of the jurors will return to the festival in July and serve as on-site jurors. During the festival, they will score the artists’ work in person and determine award winners. CherryArts, the nonprofit organization behind the Cherry Creek Arts Festival, has experience running both monitor and projected juries. The organization runs a projected jury for Cherry Creek and a monitor jury for its newer show, the Stanley Arts Festival. For CherryArts, monitor juries offer more flexibility and cost less than a projected jury. Unlike a projected jury, there is no additional image preparation involved with monitor juries. In fact, monitor juries can be conducted immediately following the show’s application deadline. While monitor juries offer a great deal of flexibility, CherryArts still sees a host of benefits with projected juries. With a projected jury, the Cherry Creek Arts Festival is able to maintain a standard for the equipment that jurors use to view images and score applicants. This reduces variables that can exist with monitor juries and gives the jurors a consistent environment in which to view and score applicants. An additional benefit to a projected jury is that jurors are able to view all of the images as one cohesive unit rather than one image at a time, something that’s also practical for a show that juries several hundred—or even several thousand—applications. The CherryArts team see real benefits in bringing together a panel of jurors who are leaders in their field and value the chemistry that occurs when jurors share expertise across different disciplines. True to its roots, the integrity of the jury process is of utmost importance to the CherryArts team. When technology shifts— as it did when juries switched from slides to digital images—CherryArts’ jury process may continue to evolve. Yet, the team remains committed to conducting a fair, balanced, and thorough jury now and in the future. If you have questions about the show, its jury, or your jury scores, contact the CherryArts team. They are dedicated to helping artists succeed! While not every jury process is conducted in the same way as the Cherry Creek Arts Festival, knowing how this prominent show conducts its jury may help you craft an application that has the best chance for making it to the next round and, ultimately, being invited to the show. Remember, professional images and clean, updated booth shots are critical to putting your best foot forward! Have questions about this blog? Reach out to the ZAPP team at contactzapp@westaf.org.